When I was a teenager, I went through a pretty major art phase. I was (and, to be honest, still am) fascinated by the work and the lives of the Monet, Van Gogh, Cézanne, The Group of 7, etc. I wanted to understand what made them see the world the way they did, allowing them to paint such colourful and vibrant images. 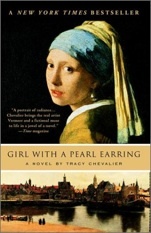 Perhaps naturally, then, when my mum told me about Tracy Chevalier's novel Girl With A Pearl Earring, a fictional account of Dutch painter Johannes Vermeer and his painting of the same name, I was hooked. 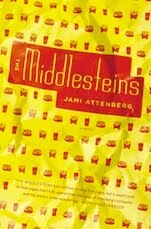 In fact, I was so intrigued that I read the entire novel in one day, on vacation, during a heat wave. The novel is set in Delft, the Dutch city where Vermeer lived and worked. But rather than centering her novel around the painter himself, Chevalier places the girl, Griet, at the centre of the narrative. Griet is a maid in the Vermeer household. Griet's father was a painter of tiles, so although his work was not on the scale of Vermeer's, she had grown up with an artist. This makes her aware of an artist's moods, and also their desire to work in a space untouched by anyone else. Griet, though, has an unusually perceptive eye, and is able to clean Vermeer's study and have it look as though no one has been there; she pays close and careful attention to where and how everything sits, and makes sure to replace it all just so. Griet's aesthetic eye impresses Vermeer, who invites her to work with him – tidying his study and mixing some of his paints – making both his wife and daughters jealous. Not much is known about the real-life Vermeer, and Chevalier works hard not to imagine him in too much detail. His family is described through the eyes of Griet, but he remains a more shadowy figure. After they begin working together, Griet, who is rather shy and unassuming, becomes more self-assured. She becomes rather like a companion to Vermeer, although to say they are friends would be a stretch because of the class and gender divide. Neither can say they are lovers, because although there is certainly tension, Chevalier is careful not to burst her beautifully crafted novel of looks and art with outright fantasy. What makes Girl With A Pearl Earring work is its plausibility. The scenes of Vermeer painting Griet for the painting that will eventually become famous are by far the most compelling in the novel. Chevalier doesn't waste details about her characters, and she pours all of the reluctance and desire between Griet and Vermeer into the looks the two exchange and the brief moments in which they touch, mostly so he can readjust how she is sitting and how the headscarf is falling. Chevalier has said that it was the look on the girl's face that inspired her to write the novel, and that shows in her attention to all the details surrounding her version of how the painting came to be. Girl With A Pear Earring is not a high-brow treatise on art. Rather, it is a specific story about a specific painting, as imagined by an author who is not an art scholar. That is to say, as much as this story is about the painting it's named after, it is also about its characters. Despite all the research that Chevalier did, she didn't let it overtake the story the she wanted to tell; her characters are compelling, and she doesn't allow the story to succumb to cliché. Whether you had an art phase or not, Griet's experience in Delft, both with Vermeer and outside of his studio, make for a story that you just can't put down.